Biafra: Dead or alive, Nnamdi Kanu remains a man of deep political conviction. A man of profound faith in the concept of self-determination. Dead or alive, Nnamdi Kanu remains a man of deep political conviction. A man of profound faith in the concept of self-determination. 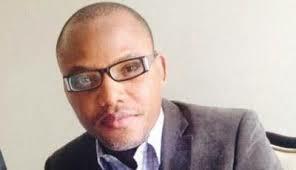 Dead or alive, Nnamdi Kanu remains a leader with the largest followership in contemporary Biafra history. Dead or alive, Nnamdi Kanu did not betray the confidence we reposed in his leadership. He never sold his political belief for filthy lucre like some before him. Dead or alive, Nnamdi kanu stood for us, staked his life, that of his family, that of his Afara kinsmen, all for the political liberation of indigenous Biafrans. Dead or alive, Nnamdi Kanu resisted the pressure to abandon Biafra activism for personal glorification and aggrandisement. Dead or alive, Nnamdi kanu will remain our leader in whom we are well pleased. Even his absence, we shall continue to fight this battle of freedom, equity and justice to the very last man standing. We will never give up nor surrender until victory is achieved. A man who left his comfort zone to fight for his people is a man you can trust to deliver. No amount of blackmail, envy, lies, propaganda nor falsehood against Nnamdi kanu, against Biafra, by the perfidious enemies of freedom will derail our collective resolve for self-determination.